Christmas Bride will make an excellent gift for the new bride, made up in her own wedding colors. 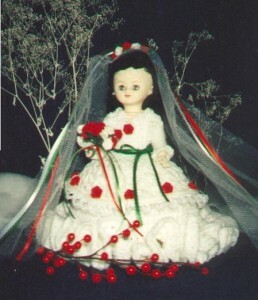 Christmas Bride is also a unique Christmas gift and holiday decoration for your bath. Happy crocheting, Debbie. With F hook and worsted weight yarn – 7 dc = 2″; 4 sc rows = 1″. With D hook and pompadour yarn – 6 sc = 1″.